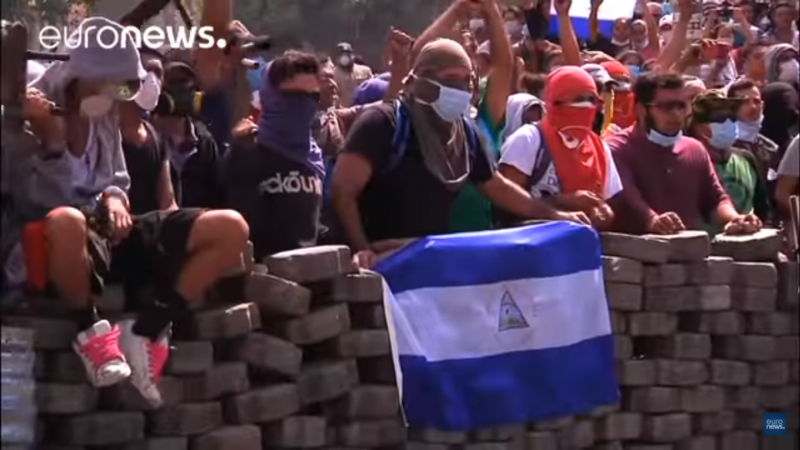 Protesters killed in Nicaragua, confirmed by independent news site Confidencial. Photo compilation by Confidencial. Individual photos via various social media channels. In Nicaragua, what began as demonstrations against social security reforms have become a national outcry against corruption, censorship and overall repression. In just five days of demonstrations, the government has carried out a violent crackdown. While state sources are reporting a death toll of 10, human rights and protest groups estimate that at least 25 people have been killed in protests, with many more injured, and dozens detained or disappeared. One journalist and one police officer are among the dead. Multiple TV networks have been banned from broadcasting the demonstrations. Access to Confidencial, a local independent news site reporting on the protester death toll, was faltering shortly before this article was published. On April 18, the government – led by President Daniel Ortega and First Lady Rosario Murillo, who is also the vice president – unilaterally adopted an executive decree reducing the pension allowance by 5% and implementing additional social security taxes to employers and employees. In response, retirees and students organized peaceful demonstrations to voice their disagreement but were met with anti-riot police forces and members of the Sandinista Youth parastatal group. Chaos erupted from there. Clashes have since turned violent and some protesters have reported that police are using live ammunition. 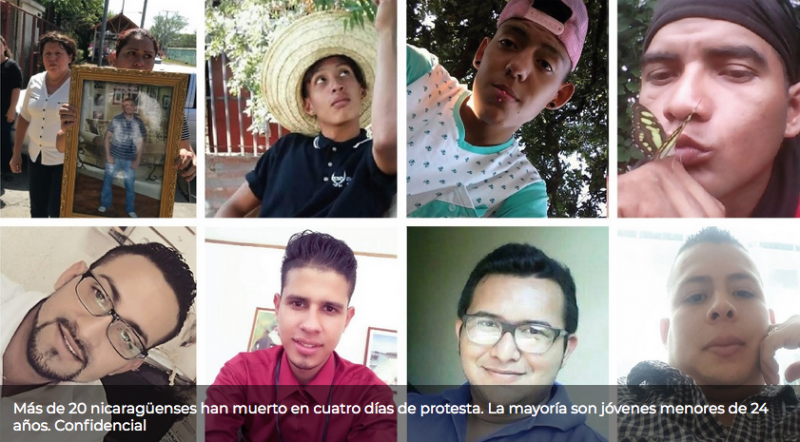 Video journalist Ángel Gahona was shot dead on April 21 while live broadcasting a protest through Facebook Live. Other journalists have been attacked and assaulted, and have had their equipment stolen. In parallel, at least three TV channels were banned from reporting on the protests. In a country where media freedom is fleeting, censorship has not deterred Nicaraguans, who are live broadcasting, tweeting and video blogging about the crisis on the ground. Hashtags such as #SOSNicaragua, #SOSINSS and #QueSeRindaTuMadre have gone viral on Twitter and Facebook, and raw videos are being uploaded on Dropbox. Through online activism, Nicaraguans are pleading for international support — though they are specifically asking the US not to intervene. Demonstrators in Managua. Screenshot from Euronews video. Journalist Wilfredo Miranda filmed a demonstration where protesters ironically shout “here is the minority,” in reference to Vice-President Murillo's belief that the outcry only represents a minority of Nicaraguans. Since students have born the brunt of police killings and aggression, civilians are gathering supplies and medicines for them in universities and in the Managua Cathedral, as the Church backs the upheaval. No son pandilleros!!! #SOSNicaragua masacran a nuestros estudiantes!!! They are not criminals!!! #SOSNicaragua they're killing our students!!! The government’s official position has been shifting in public statements, but the state-enforced violence seems to continue. President Ortega publicly ignored the protests for three days, before making an appearance on April 21. Military troops multiplied on the streets thereafter. Later, he declared that he was open to a dialogue with the private sector, who accepted the invitation under certain conditions, such as inviting other sectors of society at the table. President Ortega did not reply and instead repealed the social security reform altogether on April 22. But the protests now have expanded beyond the cause of the social security reform. Demonstrators are demanding justice for those who have been killed by police and military gunfire, and are demanding an end to government corruption. Some are calling for the overall dissolution of Ortega’s government. …the people are tired. It’s been 11 years that we’ve been in a very authoritarian [state], where we've been constantly repressed, where state decisions are made in secret, where we’re never taken into account. I think that [the social security reform] was the last straw. The now-repealed social security reform was, as Zúniga says, the last straw in a decline of government accountability, economic conditions, environmental degradation (including recent wildfires in the Indio Maíz nature reserve) and democratic institutions at large. Nicaragua, a country of six million people, lived under the Somoza authoritarian regime until the Sandinista Revolution toppled the government in 1979. In the 1980s, a civil war raged between the Sandinista regime and the “Contras”, opposition fighters financed and armed by the US government. Daniel Ortega, a former guerrillero and member of the Sandinista National Liberal Front (FSLN in Spanish) was elected president in 1985. He remained in office until he lost a reelection bid in 1990, which brought about the end of the civil war. 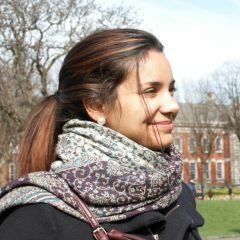 Ortega was reelected in 2007 and has remained in power ever since. His tenure has been marked by the abolition of presidential term limits, an increasingly muzzled press, opaque business deals, and direct control over the police, the military and both the judiciary and legislative branches of government.